My bucket list moment finally came, I had the glorious opportunity to meet the living legend herself, or rather what she coined herself to be “The Grandmother of Fashion”. 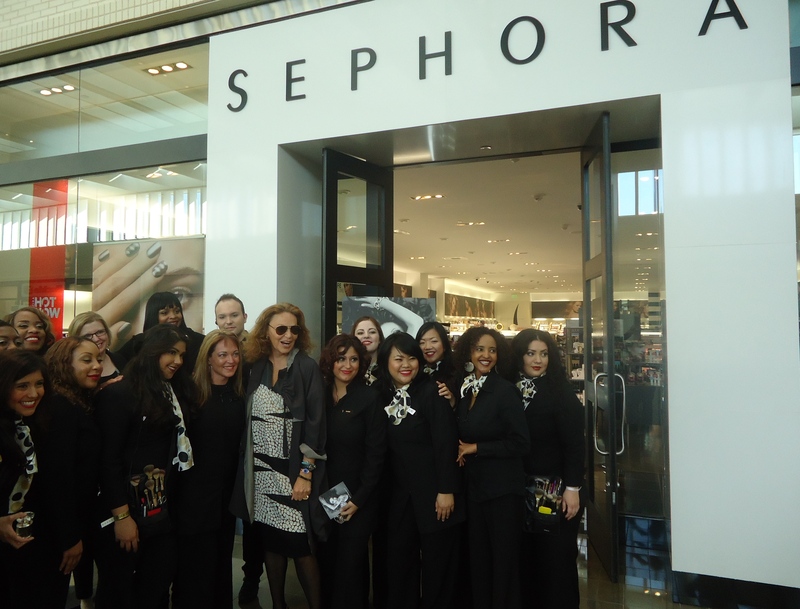 Diane Von Furstenberg placed a visit to NorthPark Center’s SEPHORA to launch her new fragrance simply named DIANE. For anyone who appreciates fashion, or anyone who celebrates life, Diane still stands to be the greatest living example of the beauty that life is. After a week of hearing about this appearance, and a day with nervous restlessness, it was finally time. Diane Von Furstenberg’s appearance was due to be at 2:30pm, however my overwhelming desire to mark this moment off my bucket list of influential people to meet , had me arriving three hours early. The saying the early bird gets the worm paid off, given that I was awarded the first place in line. So with my Gold DVF line placement bracelet I waited patiently. 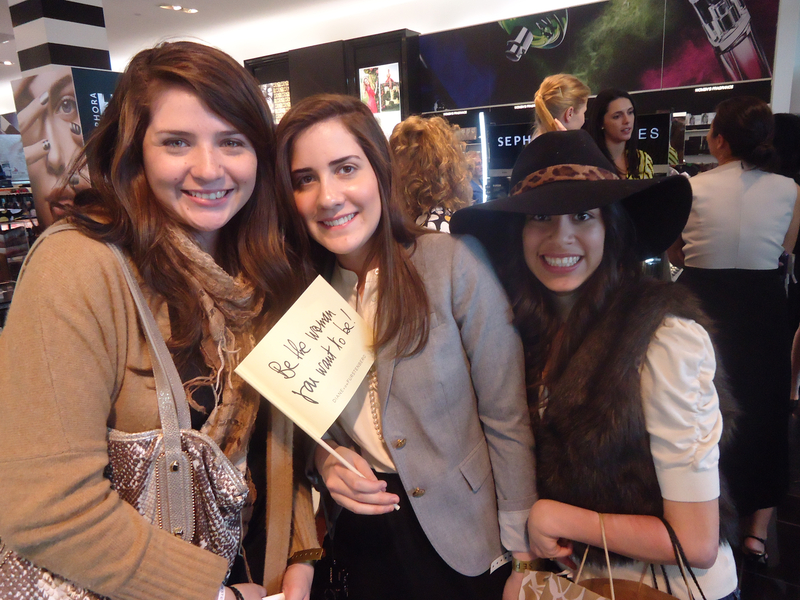 Around 12:00PM the plethora of the signature DVF Wrap dress began to appear, among many of those joining me in line were Women as young as 18 to women 50 and above. After 35years in the industry and the President of the CFDA, not to mention a former Princess, Diane’s presence was sure to attract a fabulous congregation. As I waited in line with a group of fab gals I met, we all couldn’t help but share the almost biblical anticipation of her arrival, as if we were about to see the appearance of the Holly Mother. 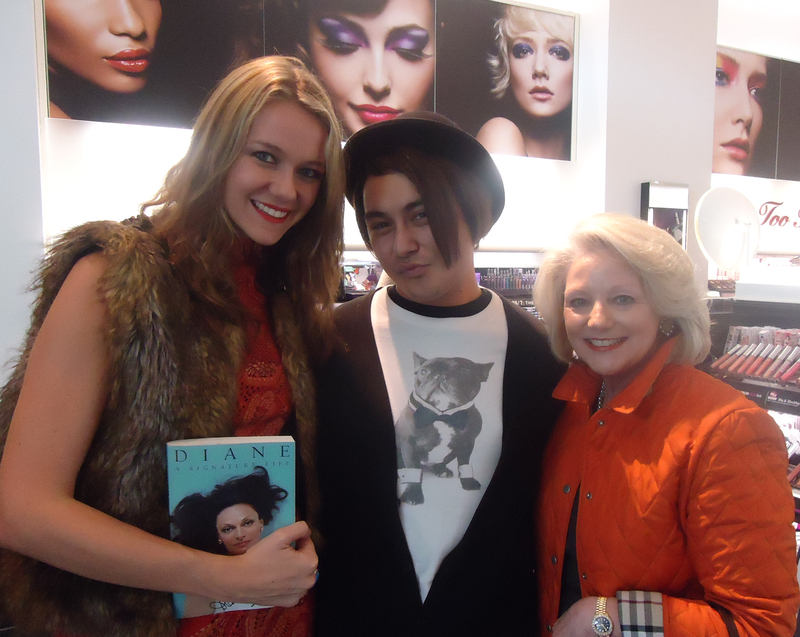 Then Diane arrived, making her way across NorthPark Center exiting Barney’s with a smile from ear to ear and waving, she greeted everyone with the most loving Hello. The energy of this woman is everything she is known by. Diane, has been named on of the most important figures of the 20th and 21st century, and the reasoning behind that is simple, she is a woman who has empowered herself, and in turn uses that empowerment to empower others to be the best of themselves, and it clearly showed within moments of her arrival. Students of WADE College expressing their devotion to Diane, and holding a banner of womanhood, "Be The Woman You Want To Be"
When my time to finally get my photo opp and bottle signed, I couldn’t help but mention to her that I was ten years old when I 1st read her name in the pages of VOGUE. She then went on to ask me how old I was now, I replied “I will be 25 in few more weeks” she then turns to her table and grabs a hand full of scented ribbons and troughs them into my bag, her wordless appreciation was transcended only by an energy. After letting her know I was a fashion writer I went on to ask if she could share a quote for my readers, she simply said, “Be the Woman You want to Be”, and secondly “Love In Life”, which is now inscribed on my Bottle of Diane. My Moment was full circle, meeting a person in this world who has become so influential was a true blessing. I was shocked to discover that her entourage only consists of two assistants, I had a presidential convoy in my mind following her every move, perhaps whispering “Liberty is Moving” to themselves. But none of that, only a woman whose Facade doesn’t compare to the extraordinary energy of her physical presence. I have met a hand full of high-profile people, but none have left me with a greater appreciation for the individual such as Diane. It truly was all I thought it would be. This entry was posted in | and tagged CFDA, DALLAS, DFW, DIANE, Diane Von Furstenberg, DVF, fashion, girl power, SEPHORA, women. Bookmark the permalink.